Examples of my "Semi-MVC" templating technique. A demo of in-field transformation with the formula language. A demo of Ajax-lookups using the "readable lookups"-view I use in the formula-demo, and a simple templating/transformation demo using DHTML. I've made a simple index-page. If you download the app/open http://domain.com/path/to/demo.nsf, you should see the links to the demos. The demos aren't very exciting/useable. Take a look at the design elements for the "magic". 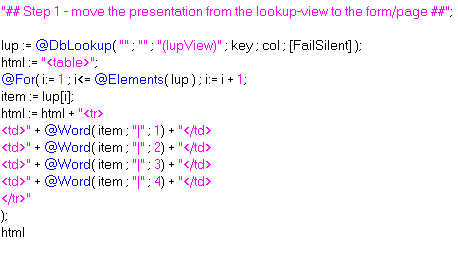 In the templating-demo, I (believe) I've used the MVC pattern for templating/transforming lookups. If anyone knowledgeable about patterns reads this, please let me know if I'm way off on this. I'm not sure if this is similar to the technique Chris mentioned in a somewhat cryptic comment on another templating blogpost. I use a naming convention for three kinds of fields. To do the actual transformation, I use a WebQueryOpen-agent. Computed for display, allow multiple values. These fields fetches the data (using dblookup/-column). One field can be used by multiple templates. Computed for display. These fields contain the description of how the data should be transformed. The label should correspond with the label of a lookup-field. Example of template. Computed for display. These fields will be filled by the result of the transformation. 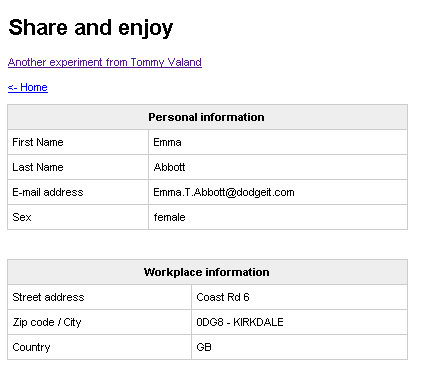 The label/description should correspond the label/description of a template-field. This agent contains the transformation logic/fills the transformed-fields. I've finally gotten started with my templating-demo again. One of the examples I promised was Ajaxy lookups (using the same view on the Web as in Notes). To make this happen, I thought it would be enough going to use ?OpenView&startkey=hello, but the effect of that "command" is start with documents starting with hello, then show the rest of the documents in the view. Jake, I've been facing a similar problem when reading the "startkey", if the key doesn't exist, it returns the next set of documents, which is wrong. Now, if you add the "untilkey" to the url you can grab only the documents you need. This is true everytime you know how to compose the untilkey key, What I did was just adding a "_" to the end of my know startkey. originally If I searched for "alexh" and the key doesn't exist, it returned the rest of the docs. now with the until key, it search for docs with ket between "alexh" and "alexh_" wich returns no documents, and that's what I expected. Thank you Alex, Jake and google! 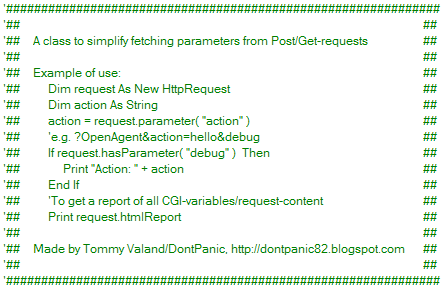 Fetching Post/Get parameters with an agent isn't easy in LotusScript with inbuilt tools. I made this simple class today as a replacement for a get-only getParameter routine I used earlier. This class should handle both get- and post-requests. Update, 01.07.2009: A small codechange to support multi-value requests. 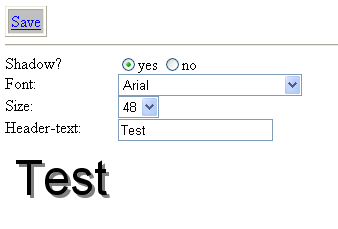 For instance from a form with checkboxes. Update, 30.05.2008: There was a bug in the class. If you had a parameter containing "=", the parameter value would be cut off before =. The class is updated with the fix (demoapp not updated). Update, 25.03.2008: I've updated the class so that it should handle request_content above 64k. Read more here. Update, 13.12.2007: I updated the class with a method to print a html-report of the request, using the docToHTML-procedure in the previous post. Update, 25.09.2008: Added functionality to fetch cookies from a request. Sometimes I make parts of a form using PassThruHTML/hidden notes-fields. 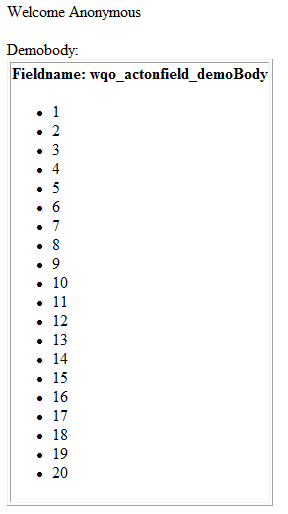 Mostly because Domino-generated HTML is hard to style (especially radio-buttons/checkboxes). This sometimes work immediately, and sometimes it takes hours to make it work. I've found it a great help to see what is being posted to the server. There are HTTP-sniffer applications that you can inspect the request with, but I find it easier to post the form to an agent, and then print the request-content as a HTML-table. 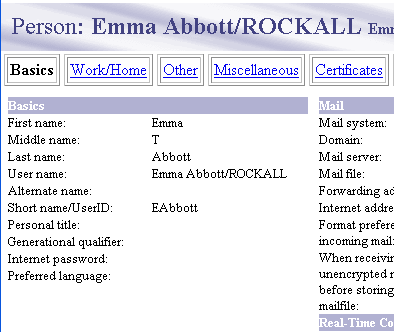 Example of output, Jake's FakeNames database, Person-form with a couple of fields filled in. To make this work in your applications, (hopefully,) you only have to copy the Script Library, InspectRequest, the agent inspectrequest, and the shared action, Inspect current form-values. Insert the shared action into the form you want to test. To inspect DocumentContext in other agents, use docToHTML in the Script Library, InspectRequest. As a rare occurence, I've actually documented this function. To get the current field-values, I trigger the equivalent of @Command( [ViewRefreshFields] ), using the Domino _doClick function. I've wanted this functionality so many times in Domino (for Ajaxy applications). Hopefully blogging about it will increase it's visibility, and get more people voting for it. What if....IBM collected all the best tips of the N/D "blogosphere" into a Redbook? I watched a japanese TV-show some weeks ago, where they interviewed a couple of japanese bloggers that converted their blogs into book-format. It would be great, if someone like IBM could extract all the best tips/techniques/patterns/etc. from the N/D "blogosphere" into a Redbook (along with accompanying demo-dbs) yearly. Maybe this would help motivating even more people to spread their knowledge through blogs. To avoid making a monsterpage, I'll split up the different tricks you can do with the readable lookups technique. First example, generating HTML from lookups with templating, in a readable way. I'll post a demo-db when I'm done making examples. First, I create a lookup-view. For real-life apps, I mostly use ComputedWhenComposed-fields with @Unique as a general lookup-field. The advantage in writing it this way is that all you have to do to add more data is to add the field-name to the fields-list. Another advantage is that there is less chance of typing errors, as less is written. The biggest disadvantage is performance. If you have a lot of documents (maybe 20 000++), I'd think the above way of writing the column formula would be more resource-heavy on view-indexing than if you simply concatenate strings. First, take a look at my previous, less readable technique, where i had pipe-separated lookup-data. A little disappointed that my favorite browser, Opera, is less represented at the end of the year than at the beginning. A colleague of mine, Torbjørn Halsne, found a better/more readable way of creating readable lookups than my "Keyword/Value lookup fields", on searchdomino. The worst part about my K/W-technique was that it wasn't really suitable for lookups that returns more than one value. This new (to me) technique adds overhead on view-indexes, but you get a lot in return. I'm working on a demo to show all the great stuff you can do with this technique. E.g. 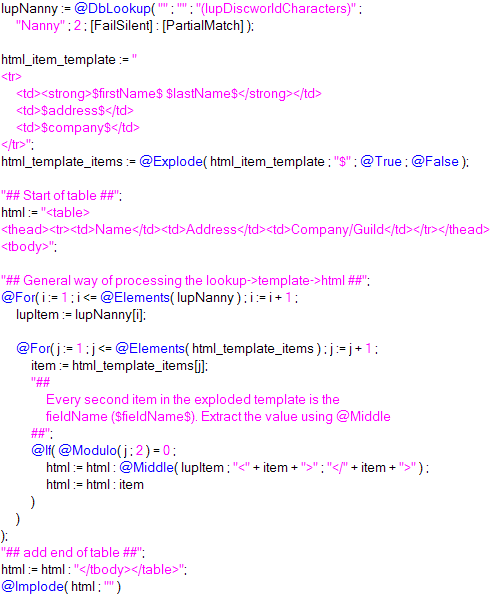 using the same view for server-side lookups as client-side lookups (XML), a lot more readable formula-templating and hopefully (if it's not too time consuming/me too lazy) LS-WQO templating demo. Hopefully I will have it ready/online before the end of the weekend. Google has just released an interesting, easy to use charting API. 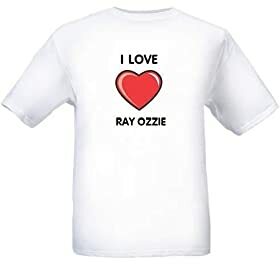 Well, actually I don't love Ray Ozzie, but someone does. Started of as a comment on "The reason the Domino Development Platform Isn't Taken Seriously", where Craig asks if it's time for the DominoDevs to grow up. My rant is also influenced by the comments posted on Nathan's "Sanity Check" that OO is the way to go/most N/D developers are lazy. This is just a wild guess, but don't think that the majority of N/D developers are willing/able to make the effort to write "serious" code. Then again, how many applications need the complexity that is Java/OO/Inheritance/MVC/etc? Now the "serious programmers" want to tighten JS (with EcmaScript 4), and make it more serious (or more precisely, make it fit their world..?). I believe that what we as a community (and Notes/Domino as a platform) need, are people who love and understand what is great about the platform, and also are able to sell the concept to developers -and- IBM. Until I see the next designer, I'm firmly convinced that the decision makers of Lotus/IBM doesn't understand what is great about the platform. From looking the latest releases (6/7/8), they see it as a collaboration/mailing platform. N/D isn't great because IBM has made a great mail/calendar application with it, but maybe the mail application is so great because of the (mysterious/genious) concept that is Notes/Domino..? Great code != Great application from the users perspective, just as Horrible code != Horrible application. Great code will probably lead to a more stable/secure/maintainable/expensive application. If you want N/D developers to write serious code, and you believe you know how to teach them, why not go together with other great minds and write a book to enlighten them? There must be publishers willing to still publish N/D books..? With all the Agile development books coming out recently, where is "Agile application development with Notes/Domino" (horrible title, I know). "Rich Internet Applications with Domino"
"Enterprise applications with Domino 8"
"Object Orientated programming in LS for dummies"
"Taking advantage of DB2 with Domino 8"
Nathan writes "Where is the love". I was on the point of starting a rant in the comment section on the post, but after half an hour of writing/rewriting my frustrations with (my perceived) impression of IBM/Lotus directions, I decided to keep the rant on my blog. Every week 5+ blogposts enter my RSS-reader about how great Notes 8 is. Almost nothing about the bugs/bad integration between the new client and Domino Designer (maybe I am the only one having problems), or how, once again, the majority (the non-java) of developers were screwed over in a release. What mostly irritates me is that the scripting tools in Domino Designer has less functionality your average notepad-clone. You (Lotus/IBM) want me to learn Java? Then give the Designer team the resources to make tools that doesn't stink of the 1990s. It doesn't make me happy when I think about how much resources they probably put into making 100+ different-looking icons look more or less like one (orange-ish) icon. From my point of view, it looks like the marketing-department in Lotus/IBM has a LOT more power/resources than the developers of Notes/Domino. Most of what's great in Notes/Domino has been there since pre version 7. Of all of the things the developer-community has asked for (in partner-/public forums), what has been implemented? Domino Designer in Eclipse? Great!! When did you say it's going to be released? Something I needed today. Thought i could share it with you. Easy to make, but sometimes one forgets that Notes supports JS. The reason I didn't use "Refresh field on keyword change" is that it's awful on web (reloads the page). The alias of the combobox/dialog list was the corresponding number to the text (One|1, etc). In Notes, the code also works with hidden/computed fields. For computed fields, set value = @ThisValue. 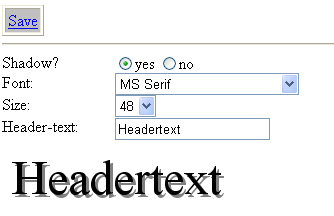 For the web, you should probably set the text-field to editable, "HTML Attributes" -> "type=\"hidden\"". In Notes, onChange fires when the field looses focus/value has changed. On the web, the event fires when you select another value. var valuefield = ( typeof valuefield == 'string' ) ? var multival = ( typeof multival == 'string' ) ? Update 28.11.07: Tim Tripcony wrote a somewhat related article about using ByVal for input parameters. Recommended read! Upon reading "Code Complete", I discovered that a way of using Subs I've previously thought of as bad practice, actually is quite normal. The author writes (I apologize if I interpreted this wrong) that some developers think that functions should be used for mathematical calculations/simple operations and procedures used for more advanced stuff. In LotusScript, from his description, a Sub is a procedure and a Function is a function (duh..). He also suggest that when you make procedures, you put input parameters (read) first , and output-parameters (modify) second, to make it easier to read the code. One of the advantages with using subs this way is that you can always maintain strong typing. This enables you to capture coding-errors at compile-time, instead of at runtime. 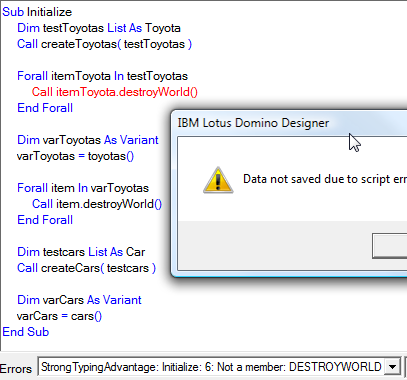 The compiler recognizes that a "Toyota" doesn't have a method "destroyWorld", whereas the variant, also a Toyota, passes through compiling. Error caught at compile-time with strong typing, whereas the variant doesn't cause an error until runtime. In most cases you could probably pinpoint the runtime-error quite fast, but catching it at compile-time is preferrable for me at least. Also, the most common error would probably be a spelling-mistake, not trying to run a random thought-up method. Performance-wise, there may also be advantages, especially if you're using inheritance/creating many objects/etc. When debugging there doesn't seem to be much advantage using strong typing over variants. If you can think of other advantages, or disadvantages for that matter, please post a comment! This only works on the web. When the user writes "dontpanic" in a field with this input validation, and try to save the document, they will be redirected to my blog. The only use-case I can think of at the top of my head is lookup-based login-forms. Another use case is maybe to limit too wide searches. A customer recently searched for *ia*, in a several CMS' and thought that the search didn't work (when I tested, the search took 3-4 minutes to complete). If you can think of/have other ways to make use of this, please post it in the comments.. I've so far only found use for it in lookup-columns, but different people, different needs. Inspiration, ExtJs, through Rich Waters. I've more or less come to the conclusion that HTML in lookup-views is evil. On one of the apps I work with, there were two access levels, reader, and editor. I used to have a column for each access, and pull HTML from the view. The errors wouldn't come as far as to applications in production now, as we test thouroughly before release, but it could still be a maintenance headache. Get rid of HTML-views, use simple lookup-views (value1|value2|value3) instead. 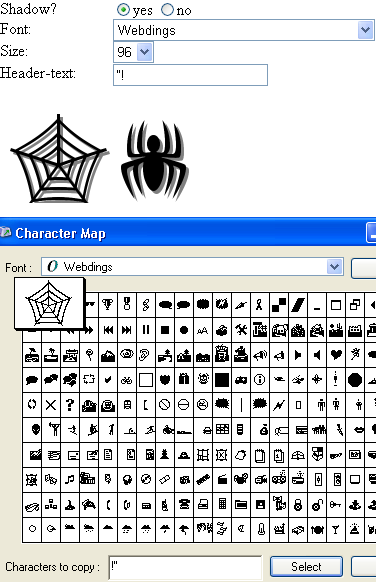 Example of transformation to HTML. You're probably not going to save any time writing the transformation to HTML using templates the first time, but you'll save time in the long run. Having the template in one string instead of concatenating bits of the html-per-item on several lines also increases readability of the code. or put @If(@UserRoles = "[Editor]" ; "" ; @Return("") ) at the top (don't do anything if not editor). Document generator - Discworld "characters"
I've mostly used Jakes fakenames-app for demos, but I've got tired of cleaning out design-elements to make it lean bytewise. 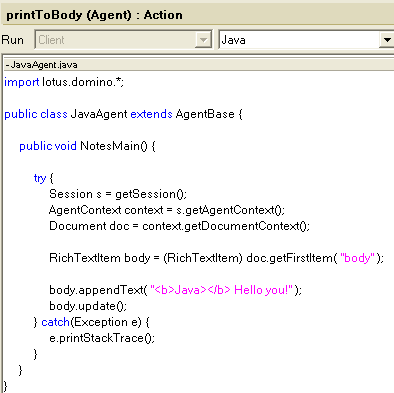 Run java-agent generateDiscworldCharaters to make documents. Currently set to 500 documents. No uniqueness check. 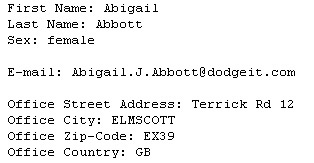 I use four arrays, first-name/title, last-name/"the Something", guild/company, address/country. Math.random() and a loop to create documents. 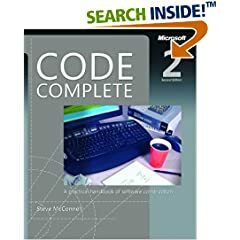 Take a strategic approach to software construction and produce superior products with this fully updated edition of Steve McConnells critically praised and award-winning guide to software development best practices. It deals with software development/project-management issues that I've seen at my place of work. A very interesting read. 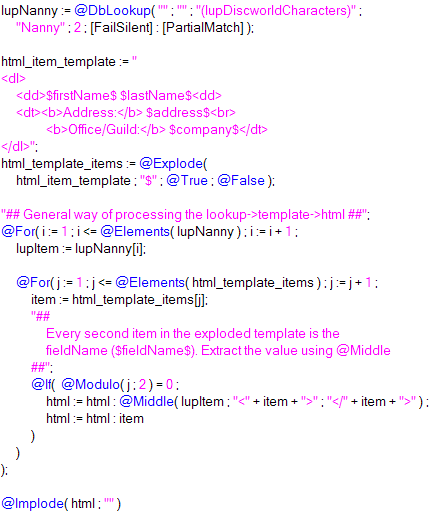 Coding templates in an agent leads to very verbose agents/a maintenance nightmare (in my opinion). Coding them in a NotesDocument makes it hard to use them in a Design-template context. This technique has little verbosity beyond the actual code to generate HTML, and works great in a Design Template-context. It supports modularity, as each field is a potential module. Since the templates are forms, the dynamic "modules" also work in stored documents. You can combine Java (through LS2J), formula (through Evaluate) and LS , just like you can when you're using agents for templating web-pages. If you're a Java-guy, then you probably would need a little more code (testing field names with Regular Expression) to achieve the same. Combine this technique with @UrlQueryString in Form Formula if you want the ability to present data in several content-types. The technique relies on Execute, a WQO-agent and field-names following a pattern. I chose Execute because it's faster than making a testing-routine for patterns. If you're planning on putting this technique to use in real applications, I suggest you use Regular Expressions, Instr, etc. to look for valid field-names, as Execute is horrible to debug. 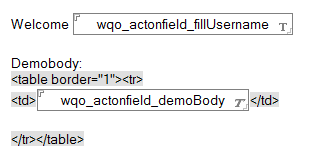 I have one pattern that I look for in a field-name, "wqo_actonfield_". The third token (separator = "_") is the method to be executed. The rest of the tokens are ignored to allow several fields executing the same function. You could also have the rest of the tokens being parameters for the method being executed. For instance field named "wqo_search_google_dontpanic" -> run a function that inserts HTML with search-results into the field. If you mark a RT-field Pass-Thru HTML (add a space before and after, Text -> Pass-Thru HTML), you can fill it with HTML through formula. You are limited to ~64k of data per field, and you will have to experiment a little with the generation of the HTML-string (using an array/implode), as Domino tends to give this error-message: HTTP Web Server: Lotus Notes Exception - The formula has exceeded the maximum allowable memory usage. 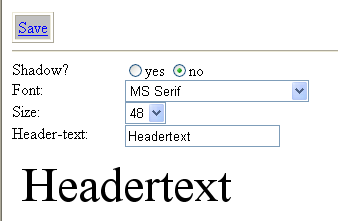 The advantage with WQO compared to setting the HTML in "Default value"/using a computed text is that you can move the code out of the form (I prefer as little as possible code in the form). 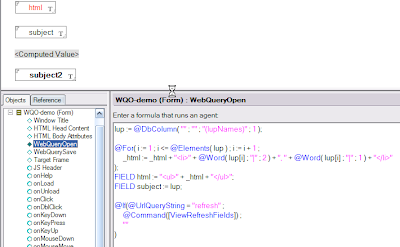 You can run multiple agents on WQO if you have several RT-fields you want to fill (menu, maincontent, etc). When generating HTML, I've been using more and more Evaluates inside LS-WQO-agents. In some cases, where the generated html is less than 64k, formula-agents may be the best "tool". 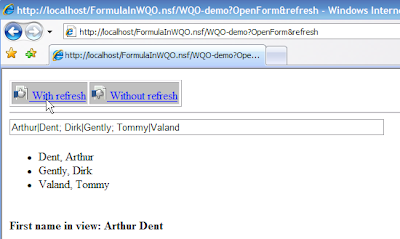 >> Demo-db with different formula-agents running by @UrlQueryString/a form with two formula WQO-agents. After reading Patricks post about onbeforeunload, I implemented the event in the CMS I mostly work with at Compendia. His code required Prototype. I've made a little demo that doesn't require a JS-lib. I use two event-listeners ( onClick/onKeypress ) on document, and "set the page dirty" when the event "indicates" that a form element has gotten its value changed (look at the sourcecode of the page). The only weakness I've found so far is that IE6 doesn't register keypress on comboboxes -> user could change a combobox-value with the keyboard and move away from the form unsaved without getting a warning. I think onBeforeUnload is supported i FF2.x, IE 4+, and newer versions of Safari. Mozilla has a simpler demo, where one field is tested. Patrick has a downloadable Demo-NSF. I sometimes get a bit frustrated by the lack of associative arrays in the formula language (more specifically in keyword lookup-fields). I’ve thought about ways to emulate this a couple of times, but never got anywhere. Today, I’ve come up with one way. It’s not beautiful, and one can argue that it’s bad practice. Error message on "keyword value not found" maintained on a column basis. "keyword-list not found" maintained in the lookup-field. If any of you have an even simpler syntax/better concept, please let me know! Added to the string concatenation "benchmark"
Standard concatenation (75 000 concatenations): 192.594s, string length, 300 000.
java.lang.StringBuffer-concatenation (75 000 concatenations): 0.062s, string length, 300 000. 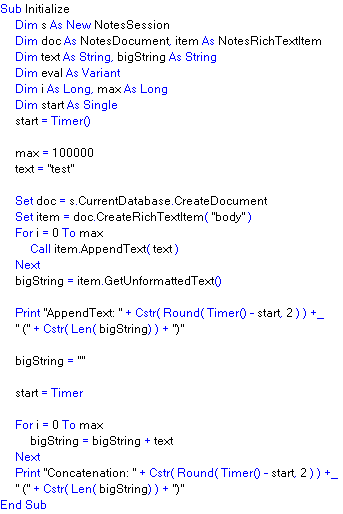 RTI-concatenation (75000 concatenations): 1.765s, string length, 300 000. The best in LS, 75 000 concatenations, 0.25s. The numbers aren't directly comparable, as I'm running on different hardware than Julian. By "Standard" concatenation, I mean bigString += string. Standard concatenation and RT-concatenation is slower in Java than in LS. Using Java's native StringBuffer class, is a lot faster than any of the competitors in LS (so far). I'm not surprised that Java's StringBuffer beats Julian's array-based StringBuffer-class in LS, as Sun probably puts a lot more effort into optimization of the language than IBM does with LS. My test ran on Notes 7.02, which I think runs version 1.4 of the Java runtime. Newer versions of Java may be even faster. My Java-skills are mediocre at best. Let me know if my test-methodology is wrong in any way. NotesSession.SavedData - great for WQO-agents? For whatever reason, even with the $PublicAccess item set to "1", Anonymous still needs at least reader or depositor access to actually write to the agent data note. I usually prefer to restrict public readers to No access with the privilege to read and write public documents, whenever possible (there is another oddity with shared fields, who don't have a GUI widget to enable public access). Reading item values works OK that way, but writing not. Obviously (at least in certain releases) Domino doesn't do a perfect job deleting agent data notes when agents are deleted. IBM has a little tool to purge orphaned agent data notes, but TeamStudio has a better (and free) utility. I got this by e-mail from a friendly German, named Fabian Brock. If the WQO agent is not run as web user, there should be no problem whatsoever. If the signer of the agent has appropriate rights to the database, he/she can modify the agent data note just like any other document. However, anonymous users will generally not have the right to create or even edit documents. The solution is the same as with conventional docs: Have your WQO agent add a $PublicAccess item set to "1", if it doesn't exist yet. Now, Anonymous is only required to have NoAccess plus the privileges to read and create public documents. Major drawback here, since SavedData is not available for public access yet, Anonymous will never be able to add this item. The agent must have been run once by a user with sufficient access rights to make the modification. And because the agent data note is recreated every time you make a modification to your agent, this might turn out to be hard to handle. One more reason to put as much of your code as possible into libraries. It seems (from a little testing) SavedData is not available for web-agents, which is a shame. I tested this in both Java and LotusScript, and got the same results. Next best solution, use a profile-document. When I first read through Julians benchmark of different ways of String concatenation, I only skimmed through to the nice graph. I read it again, and saw that he mentioned NotesSession.SavedData which I never heard of. Looked it up in the help, and got an idea (good? you decide). Wouldn't this be a great container for HTML created by WQO? Create a lookup-view with a column containing @Modified. Join(Evaluate(@Text(@DbColumn( "" : "nocache" ; ... )))) -> a string of all the dates. 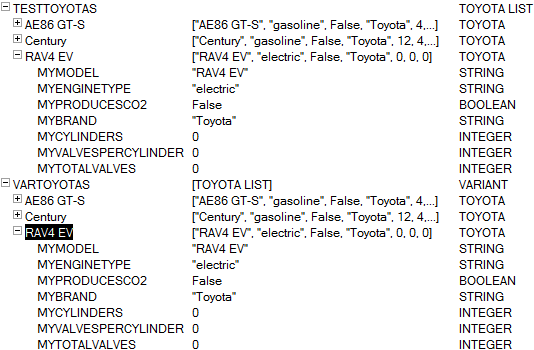 Compare this to a stored field in SavedData containing the @Modified from the previous run. If the same/SavedData has "date-field", replace RT-field in DocumentContext with the saved field in SavedData, else generate HTML/store in SavedData. Out of curiosity/"challenge" from Julian, I did a little test of ReDim performance. 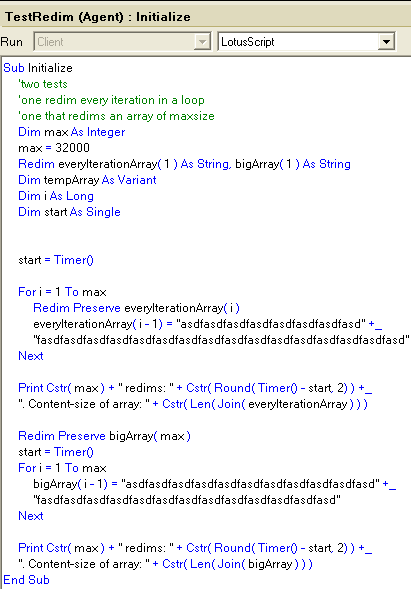 I'm not that familiar with redimming arrays, so someone let me know if this way of testing is bad. Percentwise, the difference is humongous, but in seconds, not that big of a difference. Not sure if header-generator is the best word for it. Fonts aren't platform independent. An image of a font is. Just a little experiment with Graphics2D in Java. JavaAgent running on WebQuerySave generates an image (and embeds it in the document) from header-text, selected font/-size. Also adds a shadow if desirable. Width is currently hard-coded (400px), so the biggest fonts, with font-size set to 96 won't fit. Fonts are @FontList. Since this is not available on web, I made a keyword-document containing the text-list of fonts. Not all types of fonts are supported, it seems. I use a Java WQO-agent that sets a multivalue field containing all font names in GraphicsEnvironment.getLocalGraphicsEnvironment().getAllFonts(). This way, you should get the fonts available on your machine/server. Header-images are saved as png in the systems tempfolder. If you ever were wondering, yes, you can run both a JavaAgent and a NotesAgent on WQO. Write to the same RichTextItem/etc. A little while ago, I posted that NotesRichTextItem.AppendText is FAST. On the train today home from work, I got an idea... Why not use a temporary NotesRichTextItem for string concatenation. With 100.000 string concatenations, string = string + fourLetterString took about 140 seconds. With NRTI.AT, it was finished in 1.6 seconds.. Read that again.. 100.000 concatenations in 1.6 seconds! Simply do NRTI.GetUnformattedText to extract the concatenated string after you're done. Got this from a colleague today.. I didn't think this fit into the "Complex transforms". To use @Transform as Forall loop, simply add a @Do inside @Transform, do whatever you want with the items, and have a return-value for @Transform (@Nothing,"", etc). I think there is a assumption amongst Notes/Domino developers that you can only have @If inside @Transform (I blame the documentation). This is wrong. If you put a @Do inside the @Transform, you can have "as many lines as you want". Variables created inside the @Transform is reachable from outside the transform. Discovered that Run/RunOnServer also is "chainable"
Actually two lines, since you have to have a NotesSession-variable. You'd normally want to assign this to a variable -> more lines.. But it seems that a NotesDocument needs it parent database in memory. CurrentDatabase is a property of NotesSession. AllDocuments and Search returns NotesDocumentCollection, so you could also use StampAll, etc. I briefly mentioned in my "PHP-like templating in Domino" post, but I think it deserves it's own little tip-post. You can use @UrlQueryString in form-formula of a view, to decide which form to open a document in. I may remember wrong, but I think you can do comparison like @UrlQueryString = "print" for "stand-alone" parameters, since @UrlQueryString without a parameter returns a text-list of all request-parameters. In this SNTT, I try to demonstrate some of the power of @Sort and Evaluate. The demo I've made transforms a column containing pipe-separated values to a HTML table with click-to sort (Ascending/Descending) column headers, using a form with a WebQueryOpen-agent. In the flash-demo, performance may seem a little low. The demo is running locally. I tested the form+agent in another application on a Domino-server, to see if it was as general as I wanted, and there, performance was a lot better. It took me about a minute or two to make a click-to-sort view in the other application, which I'm quite happy about. Domino has click-to-sort columns in views, but I've never tested it on the web. The strength of this way of doing it is that you have the power over the HTML. There are 20k+ documents in the demo-application, but the agent that generates the click-to-sort tables can only handle 100-1000 rows of data. I couldn't find a corrolation between the amount of data, and max number of rows. 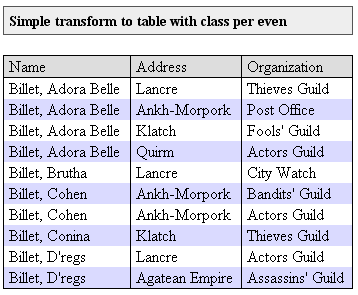 I tested a two-column table and a four column table, and I got more rows out of the four column one. At the top of the MakeSortableTable-agent, there is a parameter (maxrows) that controls the max amount of rows to show in the view. Did a little benchmark today. streng = streng + "1234"
The bigger the string-pieces, the more difference. Not a real-life benchmark, but at least it indicates that AppendText is lightning fast. A simple Regular Expression class. You may need to remove the line-breaks I've inserted to make it fit the width of the blog. "t\\w"," ", true) -> "tes pes hes"
Continuing my templating-experiment in Domino. I'm doing this for two reasons, to brush up on my Java-skills (or lack thereof), and to make the templating syntax simpler (using the power of Regular Expressions). LotusScripts blocks not possible directly. You could write LS-statements to a field in a document, run a LS-agent that Executes the string, and prints the result in the same field. Open the document again in Java, and fill in the result, but I think that would be very hard to debug. @Implode( "<li>" + lup + "</li>" ; "" ) + "</ul>"
This would be a standalone web-page, not a template referencing data from a stored document. The above example is of course possible to do with a Form or a Page. I'll see how long my interest in this experiment last. Hopefully I can make a demo that is hard to do with existing technology. If you're only interested in getting a single value from Evaluate, you don't need to Dim a Variant to containt the Array Evaluate (almost) always returns. Simply implode the evaluate, and you can assign the Evaluate directly. Templating may sound confusing, since "we" have Design Templates, but I believe that is what Ruby On Rails/PHP-guys call this. Imagine you get a XML-spec your customer want data exported in. With my method, you may just be able to copy/paste the spec into a template-document. Add field references, and you are good to go. The same with HTML-pages. Make a static mock-up in Aptana/DreamWeaver. Paste it into your template (maybe split it into modules), add field-references, and you have a nice-loking, valid (if that's what you're aiming for) dynamic (X)HTML-page. To make/edit the documents, you can use the notes-generated form. I've been wanting to do this for a while, but other experiments have overshadowed this. Thanks to this post by Michel Van Der Meiren, and a couple of beers this weekend, I finally got around to making a prototype. Since I'm lazy, I don't take the time to make data. I use the FakeNames database, kindly provided by Jake. I think making the templates took me about an hour, including finding out the names of the fields I was going to use. Rapid deployment..
To show the documents in a template, I have a view that opens the Person-documents in a form that has the correct content-type (Form Formula). In the demo, I look for Text or XML in the @UrlQueryString( "template" ). 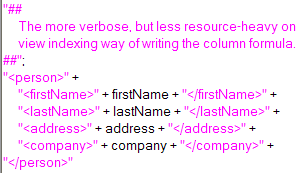 If XML, XML-form, text, Text form, else HTML-form. On WebQueryOpen, I run the agent that applies the template to the document. It prints its output to a NotesRichTextItem. The template-query string decides which template to show the document in. I first split UnformattedText of the body-field in the template on #%, which are used to process modules, if there are any. Example of module-reference, #%header#%. I test each item in the resulting array, item Like "*[A-Z,a-z]". This simple testing-method should work for HTML/XML, because they containt a lot of has brackets, which are not Like A-Z. With text-templates, there may occur errors using this. For more complex content, you could make a LS2J-class that enables you to do Regular Expression tests of the content. The reason I check for modules first, is that they can contain formula-snippets and field-references, which also should be processed. In it's current state, it doesn't support modules within modules. Then I look for field references, which are contained within #$, e.g. #$FirstName#$. Finally, I look for formula-snippets, e.g. #@WebDbName#@, in the home-link of the simple table template, and pointing to a stylesheet in the application. 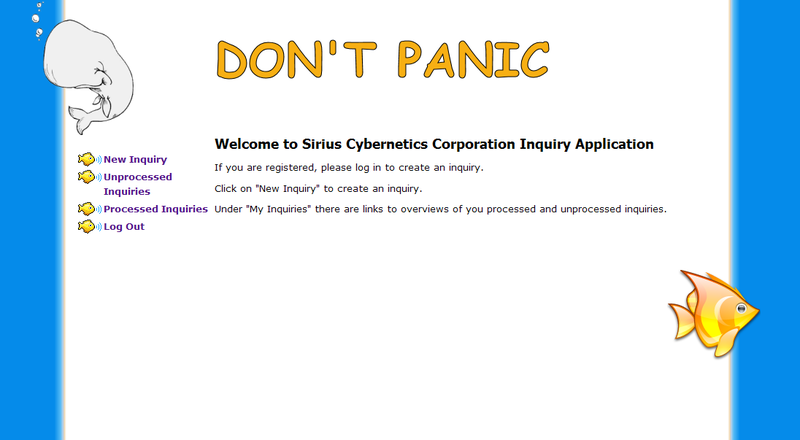 All design-elements made for the demo have DontPanic as a comment. I cleaned out a lot of the original design-elements in the app, to make it easier to find what I made for the demo. The agent that "renders" documents is called "RenderPage". It's not well commented, but I hope most of the code speaks for itself. Open the db on the Web, click on one of the people to open the document in its original form. At the top of the page, there is a button for each template I made for the demo. All the templates are in the templates-view, modules (only one in the demo) in the modules-view. If you add more advanced back-end processing, you could have inline LS/Function calls in the context of the document. e.g. 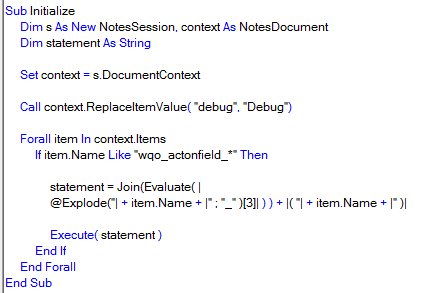 I don't think you need to pass the document-object to the inline functions, since NotesSession.DocumentContext is a global object. From a little test, it seems like it's best to Update the RT-field before running each inline LS-modification to it. html := html + "<tr><td>" + @GetField( "line" + num) + "</td></tr>"
"<table>" + html + "</table>"
You can of course do this with a a regular form using a WQO agent + computed elements, but what I hope my proposal of "Notes Templating" can do, is to add a layer of abstraction, maybe to make it easier for notes newbies to make Domino Webapps. I also think this way is more readable than a lot of computed text/Computed For Display fields. The downside is that it adds processing overhead. If you're trying to open a document from a view, using a stored @Text(@DocumentUniqueID), that don't match the documents UNID, you may get "Entry not found in index" when trying to open the document from the web. It seems the Domino Server "mistakes" a 32byte hexadecimal string to be the UNID of a document, and ignores the values in the first sorted column of the view. The quick and dirty workaround is to add a character or two before the stored ID (e.g. "u_" + UNID), in the sorted column of the view, and in the links that point to documents in the view. The best-practice solutions is for fix the application, and remove a stored UNID as a lookup-value. The simplest alternative is @Unique. I'm used to putting lookups inside fields, but it's also possible to have this kind of code directly inside WebQueryOpen or in formula-agents that are run on WQO. You can also run ViewRefreshFields back-end, before the form is rendered. You may want to do this if you have computed fields that get their values from fields that are set by code in WQO, or by a WQO-agent. It isn't possible to put REMs inside @-loops, and therefore I haven't commented these before. I just discovered that you can put strings that don't belong to a variable, anywhere within the loop. The ##'s to make it easier to distinguish comments from code. This is a basic knowledge kind of tip, so I tag it with Tims proposed tag. Since intensive string concatenation with JS crashes the JS-engine in Notes, I moved the concatenations to the formula-engine in Notes, which is more or less rock solid. In the flash, you can't see the mouse pointer blinking as much as it does in the app. The new demo-form is called DemoAnimation_formula. If you're coming to this post directly, NotesFX 0.2, which is stable here. One field per effect, less JS, speedier, possibility to set speed of animation. Dropped the alpha (still in the DB-title). It's still nothing more than a proof of concept (mostly because of instability in the Notes Client). Will still kill JS in Notes (unable to save JS-libraries/run JS in the client). Solution, KillNotes.exe. Thanks goes out to Nathan for input on the first version. I planned on having the weekend blog-free, but when people mail me about my experiments, I sometimes get a boost in motivation. If I ever get this stable, I came up with a couple other possible uses than I have in my demo. Layer-based progress bar, horizontal and vertical bar charts (dynamic, based on field values and animated if you wanted). Setting borders on layers was one of the possible limitations I feared, but thanks to my good friend, "Google Search", I found this gem by Jane Griscti. 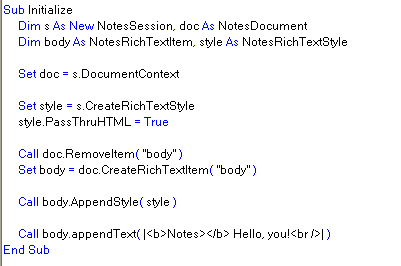 The biggest problem with the current version of NotesFX is that it seems to crash the JS-engine in the Notes Client. When this error occurs (after running 5-6 demos), you have to KillNotes.exe/start Notes again to run more demos, since Notes doesn't seem to have trash management for JS in the client. I'm planning to look at acceleration in movement/size, and see what I can do with that in an upcoming version. Not sure when/if it is possible to have these effects without getting memory leaks (which is what I think occurs). The demo-form is named "DemoAnimation". Open it in the Client, and click the different actions to see demos of effects. The JS is really messy, but if I find a way to do effects, and not overload Notes, I may clean up the code, and document usage of the JS "classes". If someone is only saving/not closing the window, slide in message, "Document has been saved. ", slide out. Maybe small blind-up/down-effects combined with hide-whens on forms. Popping in please-wait images before running something heavy. This app has been postponed. I'm currently more interested in seeing what I can get out of my NotesFX-project. The app is going to be a demo of "Ticket"-based logins (you log in, you get a ticket that lasts until you log out or 24 hours). The ticket is not the same as temporary registration. You still have to register, but instead of a NAB, I make user-documents in the application. I recently used this approach in an application that had to go inside a frameset (actually an iframe inside a frame) from a different (not sub-) domain. Cookies and IE don't play well in that kind of environment. I believe this approach also can be used if security isn't critical, but in those kinds of applications I'd probably use a cookie to store the ticket-id, and not pass it around in the URL, which I'm going to do in the demo. I aim for making it browser independent (IE/FF/Opera), but will look a little worse in IE6, because of lack of PNG transparency support. Not sure if I'm going to spend time on learning to use behavior-hacks to make it look the same as newer/better browsers. If you find this interesting, take a look at my "NotesFX", which has more effects. I don't know if this could be considered a hack. It's probably not useful (at least not in this state), but still fun. To achieve this effect, I have a layer with a table inside. In the table, I have three computed fields. One of them contains the title of the "help message", one contains the message, and one is used to add line-breaks into (-> what looks like animation). The "line-break" field has a font-size of 3, so that the animation looks somewhat smoothly, but is not too slow. I use setTimeout to call the same function until iterations=0. The demo-form is named "BlindDown". Open it in the Client to test the demo. You could also put more advanced things in the layer. I haven't tested the above suggestion, so I don't know if it's possible to do in a usable way. This one was harder than I initially had hoped, and it is still just a proof of concept at best. I built this demo on top of Jake's Fake Names application. The "autocomplete" performs a DbLookup based on the value of the field the user types in. Then a HTML (Pass Through) table with links is created from the result. Since the Notes Client is sooo dynamic when it comes to HTML, I just have to restart the universe reload the frameset to refresh the generated table of results. I couldn't get this to work in a useful manner when not in a frameset, because I can't figure out how to set the pointer to the end of the query-field when not in a frameset. This results in the pointer always going at the start of the query-field when "reloading" the form. All elements modified/created for the demo contains "DontPanic Demo" in the comments-column. The first lookup may take some time, as the view-index has to be created in the lookup-view. If you want to try out fixing the autocomplete when not in a frameset, I've made a non-frameset form, "AutoComplete". If you find a way to set the pointer at the end of the query-field, please let me know how, and I will fix the demo-application. I spent WAY(!) more time than planned to make this demo (work), so please don't hate me for not cleaning up unused code, documenting code and design elements, etc. The file-size of the demo-application is 6.66 MB according to Windows Explorer, so beware modem users and superstitious people! Update: I originally called this post "Ajax-like Autocomplete in the client", but the functionality is most like live-search. Sorry about that. Since I have vacation now, I have more time to try out different stuff i've been wondering about. For some months now, I've wanted to look at possibilities of dynamic usage of CSS in the Notes Client. It is somewhat possible, but you have to close/reopen the document you're working on (+mess with SaveOptions), and you need a subform/stylesheet per state. Unless someone finds out how to set the id of an element dynamically, this example, with one state per field will probably require too many design-elements to be put into a real-life system. What I have to do for this demo, as previously stated, is to have one CSS-file/subform per field (since each field-focus is a different state) in the form. This because I only want to highlight the field when it has focus. To do this without a dynamic parent class or id, seems impossible. Inline CSS for Notes WYSIWYG tables doesn't work. Putting a Pass-Through-HTML element around Notes WYSIWYG elemements doesn't work. 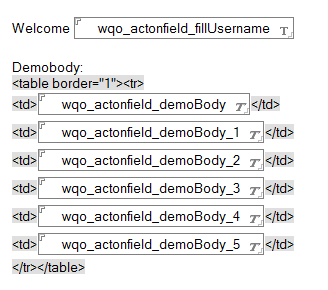 With WYSIWYG, I mean Create->Field/Table/Button/etc. It seems Notes first renders one, then the other. E.g. first render P-T-HTML, then WYSIWYG. This makes it impossible to wrap WYSIWYG elements with other elements with dynamic id's and classes. The name-field has focus -> load css for field1 (computed subform containing resource=Environment( "fieldName" ). Strange that Notes has different shorthand order than the W3C spec. field1 gets focus. Set environment variable. 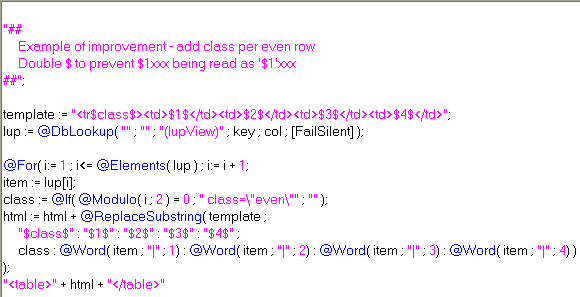 Containing element of a part of the form has computed "class=\"" + @Environment("name") + "\"". With a dynamically named parent element, I should be able to put all CSS into one file. If any of you find out more elegant ways of doing this particular functionality, please let me know. I don't know why, but I've been really motivated program/test out different ideas this weekend. This is another product of my brainstorming. I tried putting this video up on Google Video, but it got so compressed that it was impossible to see what was going on. This means that the front page currently is about 3-5MB heavy.. Sorry..
As I've stated a couple of times before, I'm not an expert programmer, and I'm quite lazy. Because of that, my demos are never production ready (stability, speed, etc). This demo is FAR from production ready. It is a proof of concept. I use mootools' Fx.Scroll class to get the smooth scrolling. Maybe there is a faster way/more efficient object (mozilla, webkit, etc) to use. Let me know if it doesn't work..
BIIG flash.. Sorry, but don't know how to get it smaller. In the demo above, I have a form with a "Microsoft Web Browser" object. If the "search" field contains the words wiki, amazon or amazonuk, I use the searchengine at the site to search for the rest of the parameters. FieldListener class for NotesUI - search on enter, etc. To redeem myself from my previous SNTT post, I did a little brainstorming, to find something worthy for SNTT. I hope this one is..
Lotus did a bad implementation of setInterval in the Notes client (several actions by the user can cause the interval to run "forever" -> high CPU usage). Because of that, the method is probably not an option for most people. The FieldListener class I made for this demo, uses the NotesTimer, and On Event Alarm to do the same. Since you're working with LS, you can add whatever functionality you want in response to something the user writes. The downside with NotesTimer is that you can only specify whole seconds (Integer) as the intervals. Worst-case scenario, there is a delay of one second between a phrase being typed and the action execution. I'm running two paralell "listeners" on one field in the demo, one for "johnny", and one for Chr(10) (Enter). Download the application to see the implementation of the demo. Johnny can speak, but my screen capture software (free) cannot listen (there is a setting for it, but it doesn't work on my machine). I have to create a variant and assign Me to it to make it work (replace Me with obj). Bug? I'll be going through the blog, and use Joe Litton's online "Format Your LotusScript" (which is made from Julian Robichaux' ls2html) to convert the LS code snippets from flat text to HTML with the "correct" colors. I've thought about it for some time, but never got around to it. A colleague of mine pointed out the bad readability (real word?) of the code (to which I responded that he should go get his eyes checked). My example is quite simple, but with some data-type testing/object testing and decent error-handling, I think you could expand this "idea" into more advanced Subs/Functions. Instead of setting the method to accept a fixed amount of parameters, set it to accept one object. In my example, I use a Class that allows you to add different objects (through a variant-array). There is (at least) one weakness with this approach. You can't add arrays to the Argument-object, as (from what I've read) an array can't contain another array. If it's a string array, you could implode the array, add a symbol at the front of the string to identify it as an array, and split it in the receiving function. doc.subject = "Some mostly harmless planet"
If you have an easier way to allow this kind of flexibility please let me know.